International Conference on Recent Advances in Clinical Research (RACR) Concludes. 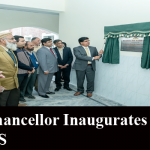 The Department of Physiology of the University of Veterinary and Animal Sciences (UVAS) Lahore in collaboration with the Higher Education Commission (HEC), Postgraduate Medical Institute Lahore (PGMI) and University of Cambridge UK organised concluding ceremony of2-day “International Conference on Recent Advances in Clinical Research (RACR)”in UVAS City Campus Lahore. Renowned Neurologist Prof Dr.Ahsan Numan presided over the concluding session of the conference while Dean Faculty of Bio Sciences Prof DrHabib-ur-Rehman,DrSohailEjaz and academicians, clinical researchers, neurologists and physiologists from public & private practitioners and students related to veterinary & animal sciences, livestock and medical sciences related to public health while experts from different countries, including the United Kingdome (UK), Philippine, South Korea, Malaysia, Russia and all over Pakistan attended. Speaking on the occasion, ProfAhsan Numanlauded the organisersfor arrangingsuch an informative conference in a befitting manner at UVAS. After comprehensive discussions with foreign delegates in the field of clinical research, theconferencerecommended that it is need to train faculty members regarding GCP (Good Clinical Practice) and then obtain accreditation certificate of ICH-GCP so that we can meet the pre-requsites of developing a solid platform for international clinical research. It also recommended to makeUVAS a CRO (Contract Research Organization) to bridge top pharmaceutical research in Pakistan and on the same front to generate manpower required to monitor the clinical trials and to train physicians on how to meet the criteria of clinical research of international standards. Theme of the conference covered all the major areas of translational medicine and drug development, ethical concern in clinical research, meta-analysis and systematic review, handling of experimental animals and conduct of clinical trials etc.